Fused filament fabrication 3D printing processes such as those performed by Ultimaker machines allow for some incredibly functional end-use parts. If you need a sturdy and strong plastic item that can be used over and over again for a very reasonable price, then you could do a lot worse than this plastic extrusion process. For those reasons and more, the robotics division of Swedish-Swiss engineering conglomerate ABB has turned to 3D printing to create a range of custom graspers (or “end effectors,” to use the proper term) for their industrial collaborative robots. ABB has designed and manufactured YuMi. 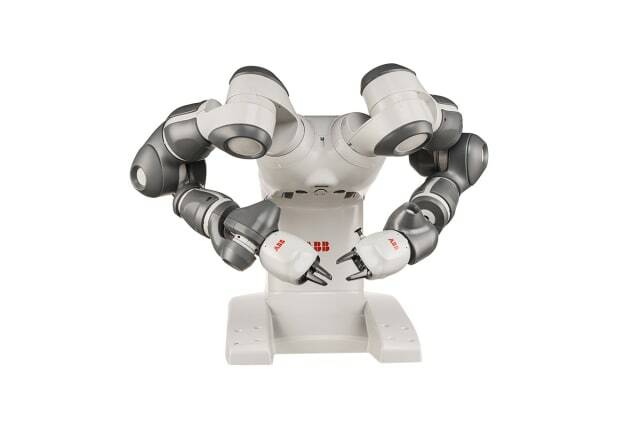 YuMi is a double-armed collaborative robot intended to work alongside humans in a production environment and is particularly good at tasks where small components need to be manipulated and inserted into larger assemblies. Such tasks are commonplace in the electronics and automotive industries. Of course, assembly components come in all different shapes and sizes, and there is not a cost-effective universal grasper solution that is capable of performing all of these maneuvers effectively. Not yet, at least. So, ABB opted for a more tailored approach that requires a range of different graspers suited for individual tasks. Not everybody at ABB was convinced of the utility of 3D printing in the beginning though. One advantage of using rapidly produced components enabled by 3D printing was that ABB could test a lot more variants as the products evolved, over a much shorter period of time than would have been permitted with traditional manufactured parts. This accelerated feasibility studies (which were required by the customers) and helped ABB fast-track their validation process, enabling many iterations to be tested and a final product that could be produced in a fraction of the usual time. Pradels noted that the design time from final 3D design to final print was reduced to just a couple of hours. And so, ABB purchased itself an Ultimaker 2 Extended+ 3D printer and, armed with a copy of the Ultimaker Cura slicing software, began to do its own thing in-house. 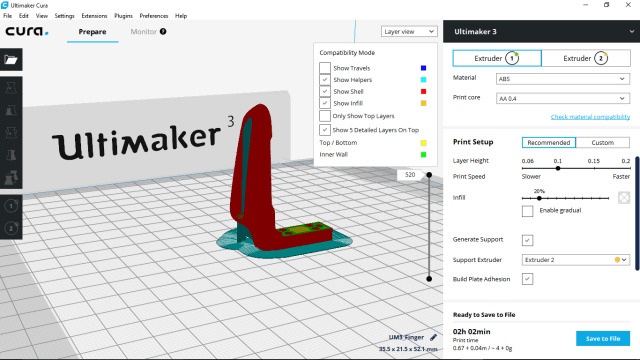 Cura is Ultimaker’s own software package (and is free to download ), which allows users to import their 3D CAD model, slice it and perform a bunch of other functions on it (such as scaling), before sending it to the machine for printing. I downloaded Cura from the Ultimaker website and installed it on my laptop. Installation was hassle free, and once the software had started, I was given the option to select a printer from Ultimaker or to define my own custom printer settings for third-party printers. As I don’t have a printer in my home, I just selected Ultimaker 3 in order to advance to the main section quickly. I already had my ABB CAD model loaded into my CAD program (SOLIDWORKS) and needed to export it as either as a 3MF, STL or OBJ file in order for Ultimaker Cura to process it for printing. I imported the STL file and it appeared in the main design window in Cura. I then began to familiarize myself with the software. On the left-hand side of the screen is a thin dark-gray panel containing several icons. 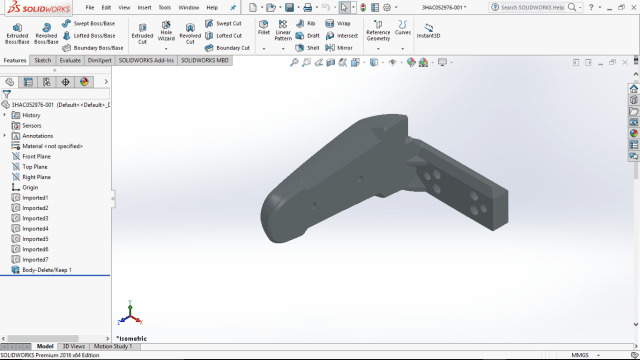 Clicking any of these icons allows the user to move the STL file on the virtual printbed on screen, scale it, rotate it, mirror it or duplicate it. Over on the right-hand side of the screen is a larger panel containing print parameter options such as extruder selection, the type of materials being used, layer height, print speed and auto-generate support. This last feature is handy—many low-end slicer software packages require you to add support materials yourself. After I tweak any of the parameters, the software slices the model automatically and recalculates the printing time based on the new settings. For this example, the total print time for the robot finger and the support material came in at 2 hours and 2 minutes (using ABS as the selected material of choice). Not bad. And if I wanted to print the object, I would simply click the button on the right-hand panel and it sends the file to the printer. Or if I wish to save the toolpath g-file for whatever reason, I can simply press the Save to File button. I have my own personal benchmark for testing software that I have never used before. If I can navigate my way around a new software package and perform the functions that I want to without needing to refer to the instruction manual, then it gets a “pass” in terms of usability. Ultimaker Cura has indeed got a “pass” from me. So, there you have it. 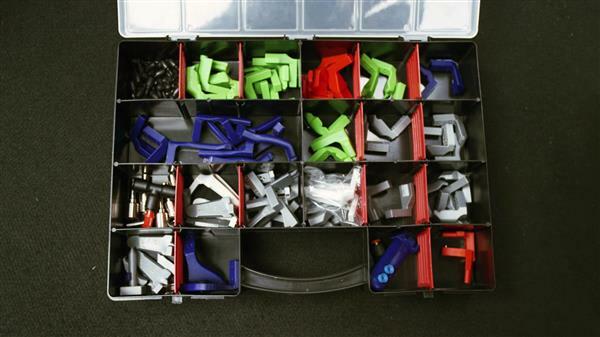 Yet another fine example of how big companies are saving time and money by 3D printing end-use components in-house. And if you’d like to read more about how collaborative robots such as YuMi are playing a big role in the future of Industry 4.0, you can take a look at our report from the Singapore International Robo Expo 2017.